JoAnne Iovoli applies the principles of Green Chemistry in her AP Biology, Chemistry, and electives Plant Science and Landscaping classes. Why go green? Because it reduces the use of chemicals used and chemical waste generated; teaches each student a safe sustainable way to learn a lesson; it’s safer for all; and prevents pollution and exposure to toxins. Iovoli trained with Beyond Benign: Green Chemistry Education to learn how to incorporate green chemistry into her lessons and labs which are aligned to the state and national standards for science education. 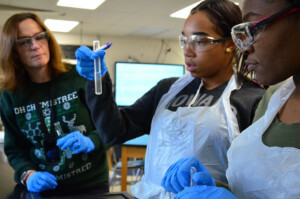 During a recent chemistry lab on Types of Reactions, chemistry students applied the principles of Green Chemistry to conduct experiments on green vs. non-green. The students were: identifying and making formulas for products in a reaction; balancing the reactions; classifying the type of chemical reactions that occurred; and determining how the reactions compared to the 12 Green Chemistry Principles. As the Chemical Hygiene Officer for the Wheatland-Chili Central School District, teacher JoAnne Iovoli is responsible for the safe handling, recycling, and disposal of chemicals used in her high school chemistry class. She ensures the safe storage of all chemicals in the MS/HS Science Department; maintains current Material Safety Data Sheets (MSDS) reference binders; conducts yearly chemical inventory and as needed, facilitates safe removal of outdated, potentially hazardous materials. Iovoli holds a Bachelor of Science Degree in Biology with a minor in Chemistry from SUNY College of Environmental Science and Forestry; a Master’s Degree in Education from the College at Brockport, and teaching certifications: 7-12 general science, chemistry, biology. She is looking towards the future to make all her chemistry labs as green as possible.